Starter Kit Includes: 1 ToiletWand Handle. Ready to go, no assembly required. Swiveling cleaning head gets to hard-to-reach places like under the rim. 6 Disinfecting Refill Heads. Powerful cleaner in each disposable head. Ready to use - no measuring, no wait. Disinfects your toilet bowl, killing 99.9% of germs. 1 Storage Caddy: Store your ToiletWand handle, toss the germy head. Disinfects your toilet bowl, killing 99.9% of germs! Contains no phosphorus. Assembled in Mexico. Active Ingredient: Glycolic Acid (11.185%), Other Ingredients (88.815%). To Clean: Open pouch of disposable cleaning heads and push handle straight down onto cleaning head unit until it clicks into place. Flush bowl before cleaning. Dip cleaning head in the toilet bowl water for 1-2 seconds. Scrub entire toilet bowl above water line. When finished, to release excess water, press cleaning head against the toilet bowl and slide blue button against the toilet bowl and slide blue button forward to release head into trash bin. Do not flush cleaning head. Flush to rinse toilet. Slide ToiletWand handle into the caddy for easy storage. To Disinfect: Empty toilet bowl before cleaning. Open pouch of disposable cleaning heads and push handle straight down onto cleaning head unit until it clicks into place. Dip cleaning head in remaining toilet bowl water for 1-2 seconds. Scrub entire toilet bowl above water line. Let sit for 10 minutes. Flush to rinse toilet. When finished, to release excess water, press cleaning head against the toilet bowl and slide blue button forward to release head into trash bin. Do not flush cleaning head. Slide ToiletWand handle into the caddy for easy storage. To Assemble Caddy (Quick and Easy One-Time Assembly): 1. Snap base onto caddy body. 2. Load pouch of cleaning heads into caddy. 3. 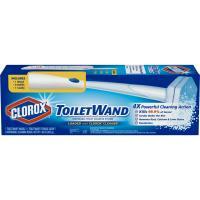 Store Clorox ToiletWand handle in caddy. Storage and Disposal: Storage - Store product in a cool, dry place and out of the reach of children. Disposal - Dispose of used cleaning pads in a trash bin inaccessible to children and pets. Do not flush. Suitable for use on all hard, nonporous surfaces where bacteria or unpleasant odors are a concern including children's toys, appliances, highchairs, garbage cans, countertops, and changing tables. Clorox Clean-Up all purpose bleach spray cleaner is designed to quickly and effectively clean, disinfect and deodorize a variety of surfaces both indoors and outdoors. It removes tough kitchen and bath stains, grease and dirt on contact, while killing over 99% of germs. This household cleaner can be used on multiple hard, nonporous surfaces throughout your home, including kitchen sinks, counters, refrigerators, appliances, tubs, toilets, fiberglass, floors, showers and tiles. With the Smart Tube technology bottle, you are guaranteed to spray every last drop. The easy to use trigger lets you spray into corners and hard to reach places. This cleaner leaves your home sparkling clean and smelling fresh. Clorox Clean Up Cleaner with Bleach gets the job done. New! Rust & hard water stain remover! Handle sold separately. Individually wrapped scrubbers mean no more dirty brush! All surfaces of the uniquely contoured scrubber clean under the rim. Entire scrubber contains pumice scrubbing foam. Made in Canada. Powerful scent - disinfects. All-purpose cleaner and disinfectant. Kills germs (Broad spectrum disinfectant against salmonella Choleraesuis, staphylococcus aureus and Trichophyton mentagrophytes (athlete's foot fungus).). Removes tough grease and dirt. Deodorizes and has a clean, fresh scent. Bottle is made with 50% minimum post-consumer plastic. Contains biodegradable cleaning agents. Contains no phosphorus. Made in the USA. Power scent - disinfects. All purpose cleaner and disinfectant. Kills germs. Removes tough grease and dirt. Deodorizes and has a clean, fresh scent. Broad spectrum disinfectant against Salmonella Choleraesuis, Staphylococcus Aureus and Trichophyton Mentagrophytes (Athlete's Foot Fungus). Contains no biodegradable cleaning agents. Contains no phosphorus. Made in the U.S.A.
Disinfectant. 4 in 1: Kills 99.9% of bacteria & viruses; Destroys soap scum; Tough on limescale; Deodorizes. Powerful foaming action. Kills 99.9% of: escherichia coli 0157:H7; rhinovirus type 39; staphylococcus aureus; rotavirus WA. Does not harm most bathroom surfaces. Contains no abrasives or bleach. Great on glazed porcelain and glazed ceramic tiles, stainless steel fixtures, laminated plastic, fiberglass fixtures, linoleum and vinyl. For all other surfaces, test on a small hidden area before use. Shower doors. Tubs and glazed tile. Vanity tops, sinks & chrome fixtures. Contains no phosphates. Made in USA. Disinfects & cleans tough stains. Use for tough cleaning problems all around your house. This all purpose cleanser cleans and disinfects porcelain, stainless steel, fiberglass, Corian solid surfaces, natural marble, and glazed ceramic tile without scratching (On delicate surfaces like plastic, imitation marble and appliance enamel, use plenty of water, rub gently and rinse. For unfamiliar surfaces, test small area first. Do not use on silver, painted surfaces, walls, soft plastic, aluminum or rubber items (except tires). Do not mix with other products, especially toilet bowl cleaners or products that contain ammonia). Kitchen sinks and Countertops: Brightens porcelain, makes Corian solid surfaces ultra-clean, puts the glisten back into stainless steel and safely cleans tough, crusty food stains. Stoves: Cuts grease and scours off cooked-on food. Bathroom Sinks, Tubs, Tile, Fixtures: Cuts through soap scum and mildew stains on porcelain, fiberglass, and glazed ceramic tile. Toilet Bowl: Disinfects the toilet bowl as it cleans. Wipes out most household germs including Staphylococcus aureus, Salmonella Choleraesuis, and Pseudomonas aeruginosa. Contains no phosphate. Mr. Clean Magic Eraser Original will help your walls, baseboards, floors, switch plates, blinds and more look like new again by easily removing scuff marks and dirt. To discover the cleaning possibilities, simply take a swipe. Its water-activated micro-scrubbers reach into the surface grooves, lifting away built up grease and soap scum. The Mr. Clean Magic Eraser Original is so powerful that each swipe removes more grime than the leading all-purpose spray cleaner, and it has no harsh chemicals. Before long, you'll be back to the things you love best in a brighter, cleaner space. Lysol Brand Sparkling Lemon & Sunflower Essence Scent Power & Fresh Multi-Surface Cleaner. Disinfectant Scrubbing Bubbles Bathroom Cleaner's antibacterial and antiviral formula foams as it expands into nooks and crannies, helping to lift dirt, fight grime, remove soap scum, and kill 99.9% of viruses and bacteria. You can hear it working as this multi-surface cleaner safely cleans tile, glazed porcelain surfaces, fiberglass and more. It even works upside down, letting you get to all those hard-to-reach tight spots. Lasts up to 1 hour! With Ultra last technology. Fresh, inviting Glade Air Infusions. Eliminates odors and freshens the air with a subtle blend of natural scents that invite you in and leave your home smelling fresh. Contains no CFC's which deplete the ozone layer. Eliminates odors and freshens air. Powder Fresh gives any room of your home the comfortable, familiar scent of talcum softness. Contains no CFC's which deplete the ozone layer. Removes stains & disinfects. Kills germs on hard, nonporous surfaces: Salmonella enterica, Cold Virus (Rhinovirus Type 37), Flu Virus (Influenza A2, Hong Kong). Removes bathroom stains. Degreaser. Contains no phosphorus. Made in the USA. Apply to a wet surface, rub lightly to make a paste with sponge or pad. Clean and rinse. Can be used all around the house on items such as pots and pans, porcelain, bathroom fixture, ceramic tiles and outdoor items such as grills and garbage cans. This Ajax with Bleach Cleaner is one of many top quality items in our All Purpose Cleaners department. Destroys mold & mildew. Kills 99.9% of viruses & bacteria (Kills 99.9% of: rhinovirus type 39, salmonella enterica, staphylococcus aureus and rotavirus WA). Removes soap scum. Whitens as it cleans. Use this product on bathtubs, vinyl shower curtains, glazed ceramic tile sinks, counters and grout. Rinse bathtub/shower surfaces with water after using product. Contains no phosphates. Made in USA. TABASCO brand products are made by McIlhenny Company, founded in 1868 on Avery Island, Louisiana, and still family-owned and operated on that very site. SkinnyPop Popcorn Skinny Pack Pure Popped Perfection.Certified GF, gluten-free.Non GMO project.Verified.nongmoproejct.org.Certified vegan, vegan.org.Whole grain 12g or more per serving.Eat 48g or more of whole grains daily.wholegraincouncil.org.Non GMO.No artificial ingredients.Gluten free.See back panel for nutritional information.Per serving (1 bag):100 Calories.0.5g sat fat, 3% DV.45mg sodium, 2% DV.0g sugars. Birds Eye All Natural Baby Gold & White Corn Deluxe Baby Vegetables Extra sweet petite gold & white corn kernels.No preservatives. Each satisfying spoonful of Campbell's Condensed Minestrone Soup brims with a bounty of farm-grown veggies-from carrots, potatoes, green beans, peas, tomatoes, zucchini and more!-combined with beans and enriched pasta shells. You'll find comfort in this Italian classic. Hormel Black Label Bacon is specially selected. This bacon delivers our highest standard of quality available. Don't settle for anything less! There's a name for food this good Hormel Foods. KIND Healthy Grains Vanilla Blueberry.100% whole grains.22g per bar.Chewy with a crunch.Gluten free.All Natural.Non GMO.5 super grains.Oats, millet, quinoa, amaranth, buckwheat.Ingredients you can see & pronounce.5-1.2 oz (35g) granola bars. Counting calories? These wholesome, nutritious breads have 45 calories a slicewith all the Pepperidge Farm taste you love. Dr Pepper is always original. A signature blend of 23 flavors makes every sip of Dr Pepper truly unique. Theres nothing like a Dr Pepper. A family tradition since 1997. No high fructose corn syrup. We use only the finest all natural ingredients in this authentic syrup. No artificial flavor or colors. No high fructose corn syrup or preservatives. Enjoy! So fast. Affordable and delivered right to room. Would use every time ! !